It was another good year for Skip Horner Worldwide, made most special by the many wonderful adventurers who joined us on our varied journeys. We love what we do, and we love who we do it with. We traveled to four continents for seven different trips, from first-ascent mountain climbs to comfortable cruises. I climbed Kilimanjaro twice. The first time, in January, we took 5 clients up the Rongai Route that had become our staple over the previous 15 years. It’s a lovely route that sees fewer climbers than the standard routes. I was back in July to take 5 others to the summit, but we used the seldom-traveled Northern Circuit Route. This is a longer, more rugged trail that traverses high above neighboring Kenya and Amboseli Park. We could almost hear the lions roaring down there. This was my 32nd ascent of the mountain. In August I took three men, a father & two sons, on a climbing expedition to Greenland. I chartered two open 19’ boats with enormous outboards driven by Inuit hunters for the wild 150 mile run through the open waters and enormous icebergs of Scoresby Sound, the deepest and longest fjordal system in Greenland. After 6 hours of high-speed salt-water excitement we arrived at a camp along a deep and remote secondary fjord, adjacent to the glacial river that drained the peaks we would climb. The rock walls climbed several thousand feet above us, but the river valley gave good access to the peaks beyond. The only previous footprints here were made by Inuit hunting parties, so the mountains were mostly virgin. With perfect weather every day we explored the region and climbed two nice peaks, including the probable first ascent of a lovely glaciated mountain 5000’ above sea level. In September Elizabeth & I drove through Ireland. After a couple of de rigour days in Dublin, we navigated backroads up north, searching for her roots, then out along the wild west coastal roads. My appreciation for Guinness grew strong from our daily visits to local pubs. In October I met a small group in southern Utah for a week of mountain biking and canyoneering around Zion National Park. We camped among the pinyons and junipers on the rim of Gooseberry Mesa, a system of dedicated BLM mountain-biking trails. Every day we explored the canyons surrounding Zion and rode our bikes along the sandy desert and sandstone slickrock trails. In December I led a private trip to Colombia, guiding a friend/client up Cerro Tolima, a 17,000’ peak, to celebrate his 70th birthday. Tolima is hidden deep in the back-country, so it took several days to approach the peak on foot, with mule support. We stayed in rustic inns and ate local food along the way. 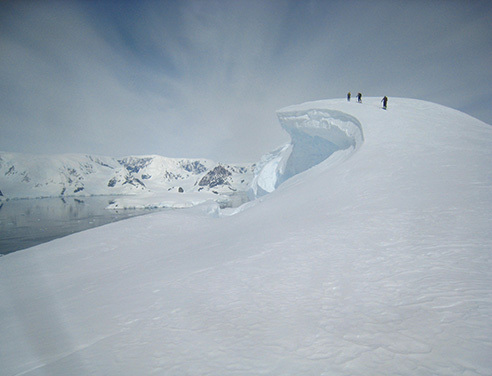 The climb itself was over 4th class rock and up onto glacier, leading to a snowy summit. Then it rained, and the trails ran deep with slippery mud. We could only laugh as we slid on our backsides most of the way out. and we lived the good life aboard our lovely ship.